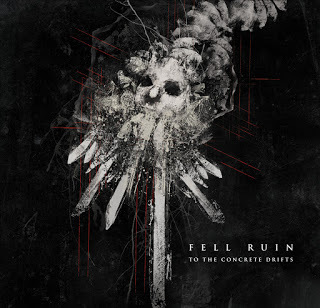 Fell Ruin is a Michigan, USA based band consisting of drummer August Krueger, bassist Jeff McMullen, guitarist Robert Radtke, and vocalist Brian Sheehan. They supposedly play black doom/sludge black death metal. However, despite this being quite a comprehensive and pretty accurate description of their musical direction, it still doesn’t cover it completely. For instance, apart from the aforementioned influences there’s also some progressive elements complete with accessory soundscapes that leave their mark on Fell Ruin’s music here and there. In fact, there’s influences from about every metal genre you can think of to be found in their music, though not all equally obvious, so to be honest they really cannot be classified. Their music is best described as a rollercoaster ride through many different, both more and less dark and both more and less notable corners of metal. Regardless the inevitable complexity their playing style calls for they managed to catch this rollercoaster ride in a 5 song release, their second release and their first full-length since coming into existence in 2015. It’s called To The Concrete Drifts. It kicks off with an acoustic piece fittingly named Respire, which actually is an excellent thing to do before having the rest of this release unleash its force on you. From there on, between the first slow, ominous tones of The Lucid Shell and the dying squeal of …And Choke On Nocturnal Breath, you will get to know the many different faces of Fell Ruin in four episodes. Though audibly different the basics of each separate song are the same: A massive, complexly structured composition with the emphasis on black and doom metal filled with speed-, genre and atmosphere changes that are forged into a thoughtful, overwhelming, dark adventure of music. The Lucid Shell impresses as a doom metal song at first, but after a few minutes in which the atmosphere increasingly darkens, the guitarist sharpens his plectrum, leading the rhythm to and through a vicious black metal tempo, where both the drums and the bass fight out a fierce duel, which remains undecided throughout the remainder of the song. Pretty much the same recipe is used in Spy Fiction Folds In Ready Streets. The slow, atmospheric start, the build up towards evil, the dueling rhythm section framed by guitar work that jumps from tight and heavy to insane shrieks and the foul growls of vocalist Brian that vary from deceivingly unctuous to provocatively evil. Things are no different in the last two songs of the album either, and to be honest it would be disappointing if they were. Both To Wither The Golden Rose In Bloom and …And Choke On Nocturnal Breath seamlessly fit their two predecessors, though the music never impresses as repetitive. To Wither.. drops the heaviest load on your shoulder in terms of oppressiveness, engulfing you in unnerving darkness. Apparently when composing …And Choke… the guys had one final trick, or surprise if you will, up their sleeves, judging by the strumming bass and guitar lines near the end. To The Concrete Drifts is a release that definitely leaves an impression when you first hear it. Whether it’s a good or a bad impression is of course up to your personal preferences, but I for one think this is a memorable release. The complexity of the music, the massive structure of the songs, the ongoing switches between slow, heavy, burdensome doom and inciting black metal, punctuated with a wide variety of influences from an equally wide variety of genres keeps this one interesting throughout the entirety of the album. Even though no two seconds are the same, it still is a coherent piece of work, no small feat in my opinion. If they can keep this up, a great future may lay ahead of them, especially when you keep in mind that this is only their second release. Recommended.